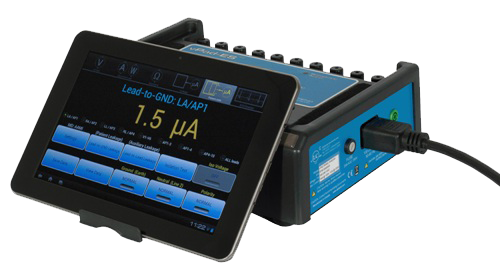 The vPad series of electrical safety testing devices combines an Android tablet (wired or wireless) with a measurement platform to create a revolutionary test system. The measurement platform provides the normal assortment of electrical measurements (voltage, current and resistance) of the commonly used medical Electrical Safety Standards. Base unit: 11.8 x 8.9 x 3.3 in. vPad-ES: Begin your Vision Pad experience with a new standard in ‘basic’ manual testing for creating automation sequences for an almost limitless amount of scenarios. Name the autosequences and then add additional details in the description field. Display test Instructions along with pictures or video to fully describe testing steps. Record Manager: View/Print/Convert and Copy Test Reports.Record Manager provides direct access to all test reports created by the vPad Apps.Reports can be reviewed on screen. In addition, reports can be converted to PDF documents; printed to a wireless printer; or copied to USB or a Bluetooth device (PC) one at a time, or in user selected groups. File management has never been so easy or complete on a basic manual safety tester.